ESPN: "NEW YORK -- Washington Wizards teammates Gilbert Arenas and Javaris Crittenton drew guns on each other during a Christmas Eve locker room argument over a gambling debt, according to The New York Post." - Hey, if you need a gun to settle a dispute, or defend yourself, you're not much of a man. What every happened to that time when two men would stand toe to toe and slug it out? Why in the world do these punks continue to get hired, and paid, to play a game? Clearly they're not men, and not deserving. Boot them out of the NBA, let them get a job at 7-11, or McDonald's and let's see how much they like that. Better yet, put them in jail for a while, cool their jets a bit. Maybe, just maybe, they'll grow up a bit. Looks like that worked for Michael Vick. Sports Illustrated: "Harrison said that he can't understand why Plaxico Burress would risk everything in a club. He said that if a player is scared, they should either hire bodyguards or just stay home. Bringing a gun to a club is not acceptable." - Bravo. Young athletes, just stay home. You have everything at your fingertips. You can go out, sure, but I'd say stay away from the clubs. You can have fun without them. ESPN.com: "LONDON -- London has launched an audacious bid to stage the Super Bowl within the next eight years, a move that would see the United States' biggest sporting event played overseas for the first time, the Sunday Telegraph has reported." ESPN.com: "NEW YORK -- Yankees manager Joe Girardi lashed out Sunday at a potentially damaging biography of Alex Rodriguez, questioning why the book was written and its accelerated release date." - Really? Let's see... famous, arrogant, baseball player plus illegal drug abuse equals money for someone, right? Major League Baseball's steroid problem is a train wreck. First off, the players shouldn't have used steroids when they were declared against the rules. If they'd come clean when the investigations started, and the now infamous list was created, this would've all died off. Andy Pettitte came clean, he's been forgiven, and the transgression against the sport forgotten. MLB will survive and it'll be better for it. Maybe they should consider allowing performance enhancing substances? Monitor it, completely, via MLB provided doctors. Then everyone could, if they wanted, be on a level playing field. I'm not saying it's a good idea, but it would prevent this form of cheating in the game. ESPN: "Undoubtedly, the Yankees would have preferred that Alex Rodriguez sit down with all reporters one time. He chose to speak with Peter Gammons last week, however, giving all other reporters a week to comb over the transcript of the interview and find the loopholes in what he said , whether they were intentionally crafted or not." - I don't believe a word Alex Rodriguez says. Has anyone paid attention to the change in his size since he joined the Yankees? Coincidence? I think not. Chances are he's still juicing, but with something undetectable. He's one of those guys that's all about image. Everything is orchestrated, every little thing. When questioned outside what he'd rehearsed, he couldn't answer the question. The thing that puzzles me, is why lie further? His test was positive for two things, unless that test was tainted, he's lying about what he took. Why not come clean? Also, things begs the question, why not have professional leagues where performance enhancers are allowed and monitored by the league? You're a pro, if you want to juice, juice. If you don't and you can still compete, more power to you. What about two options, one league that allows steroids, one that doesn't? ESPN: "The thing is, though, Seattle's sports year isn't even that bad yet as Big Lo lies in the hospital with summer approaching. The Mariners aren't even halfway to becoming the first team to lose 100 games with a payroll of more than $100 million, nor have they fired their first manager of the season, let alone their second. The Washington Huskies have yet to suffer a single one of their historic 12 losses or fire their coach or get called for delay of game on their first play from scrimmage. (Delay of game on your first offensive play of a game -- how is that possible? What, did Kenny G play the national anthem?) The preseason magazines hitting the newsstands are picking the Seahawks to win the NFC West for the fifth straight year, not lose 11 games (and counting) on the way to saying goodbye to their coach, Mike Holmgren. And most importantly, the SuperSonics trial over their lease has yet to begin, so there still is hope they will remain in Seattle rather than move to Oklahoma @$&%ing City." - Maybe 2009 will be better. ESPN.com: "Blowing up locker rooms is second nature to Owens, so it was only a matter of time before there was carnage in Dallas." - I became a Chicago Bears fan the day Dallas acquired Team Obliterator, A.K.A. Terrell Owens. Jerry Jones is an idiot, but at one time he had the sense to hire a good coach, in Jimmy Johnson, but he even screwed that up. He and Al Davis probably have a private club for owners that like to interfere with their coaches and ruin seasons. If Jerry Jones had a lick of sense, which I don't believe he does, he'd dump T.O. in a heartbeat. He has a great receiving staff in Witten, Austin, Crayton, and finally Williams. Do you recall how well he 'boys were doing before they acquired Williams? I think that is what ultimately has T.O. on the defensive. Williams is the better receiver, and T.O. knows it. He's feeling the pressure and as usual is cracking under the weight. Oh, and something that T.O. keeps whining about is lack of passes thrown his way. If you look at the stats he's the leader in balls thrown to(see the table mid way down the page), and the leading receiver on the team. The problem is he drops too darned many passes. I say the Cowboys should throw to T.O. all day today, let's see where that gets 'em. No passes to Witten, who can catch, or Austin, who can catch, or Williams who can score TD's. No, just throw to T.O. all day, the Giants can just single cover him, he'll drop some on his own. The Cowboys could finish the season with three losses, here's hoping! ESPN: "Let us pause while BCS proponents try to clear their throats and their logic." - If you follow College Football you'll have an opinion about the BCS. Today we have a prime example of how flawed it really is. The Oklahoma Sooners leapfrogged the Texas Longhorns yesterday, even though Texas beat Oklahoma head-to-head. Of course the current standings will change next week because #1 Alabama will face #4 Florida. Next week will be a bigger mess because one of those teams will lose, go 'Bama! Let's hope Mizzou can pull off some sort of miracle next weekend as they face #2 Oklahoma for the Big 12 title. That would completely wreck the "lovely" BCS system. We need a playoff system, PERIOD! ESPN: "New York Giants receiver Plaxico Burress has told the team that he accidentally shot himself Friday night, a league official told ESPN's Sal Paolantonio." - So, why hasn't anyone asked the obvious question? Why was this idiot carrying a gun in a nightclub? If you feel the need to carry a gun into the club I have a piece of advice for you, don't go to the club. Why, why, are American professional sports full of thug gangsters? New rule in the NFL, caught carrying a gun in public and you're banished from the sport. Plaxico Burress should be traded to the Cowboys, they like idiot thugs, winer receivers that can't catch, and lowlife of the NFL. Jerry Jones welcomes all with arms wide open. Be thankful I'm not the Commissioner of the NFL. Two years ago I talked about NCAA Football needing a playoff system. We still need one. The smaller NCAA divisions have a playoff system, why not the "big boys?" So, given my eight team system, here's what it would look like today, based on BCS Ranking, all games played at a neutral site. So, based on those matchups, here's round two in my guesstimation. Of course others will have their opinions of Rob's Fantasy NCAA Playoff System. It would appear a new owner, a move to Oklahoma City, and "better" arena have turned the former Seattle Sonics into champions! Way to go Thunder! Oh, apparently I misread the W-L columns, at second glance the Thunder stink, they're 1-14! Way to dismantle a once great franchise Mr. Bennett. Gothamist: "Perhaps inspired by yesterday's NY Post cartoon by Delonas, featuring Mr. Met watch CitField's name changed to Taxpayer Bailout Field, two politicians from State Island are proposing that Citifield be named Citi/Taxpayer Field. Because what better way than to pay tribute to Citigroup's $400 million investment in the Mets' new home, now that taxpayers are on the hook for about $350 billion with the Citi bailout." - I'm all for the name Taxpayer Field. Our daughter plays Volleyball for the Exeter Union High School Monarchs. They've recently been crowned the Division III Volleyball Central Section Champions! Congratulations girls! That happened last Thursday, in dramatic fashion. The crushed their opponent in straight sets, 25-4, 25-15, 25-16. The entire time they were on the run through the playoffs, and subsequent title game Bug, our daughter, would send us a simple text message, "Starbucks! Huh? Yes, that was the entire content of the message but we knew what it meant. When the run began she happened to visit Starbucks with Mom a couple of hours before the game. Since then she's been doing the same thing before each game, sending me her "Starbucks!" message and the team has continued to win. Tonight the girls begin their march to a state title, so a few minutes I received the familiar "Starbucks!" message, let's hope the streak continues. Four more victories and they'll be California Division III State Champions. Wow, that has a nice ring to it! Good luck Bug, and good luck Lady Monarchs! Tonight 7PM, EUHS gym, Exeter vs. Campbell Hall. Here are some links to local papers covering their Central Section Title Game. I'd like to throw my hat in the ring for the Head Coaching position with the Oakland Raiders. While I have no experience as a head coach I do love the game and I'm more than willing to defer player and coaching decisions to you. I'll happily stand on the sidelines barking orders from high in the owners box, I'll even wash your car for you if you'd like. I'm willing to take a low salary, let's say $250,000.00 per year, with bonuses for reaching the playoffs, winning the AFC title, and winning the Super Bowl. Here's the bonus breakdown I'd like to have. For a total of $750,000.00 in salary and bonuses for a Super Bowl Title, I believe that's small peanuts to restore the Oakland Raiders to their former glory. Thank you for your consideration Mr. Davis. Visalia Times Delta: "Exeter 3, Immanuel 0: Taylor Fahrni had 12 kills and three blocks to help the Monarchs defeat the Eagles in straight sets, 25-16, 25-19, 25-15, in their Central Sequoia League opener." ESPN.com: "FOXBOROUGH, Mass. -- Ronnie Brown and the lowly Miami Dolphins ended the Patriots' record winning streak and made New England's defense look as shaky as its Tom Brady-less offense Sund" - It's near impossible to go undefeated in the NFL, only ONE team has ever done it, no I don't count just the regular season, it's all or nothing in my book. Anywho, now that the Patriots have dropped a game how long with it be before Randy Moss throws his team, or his QB, under the bus? Record your guess in the comments. My guess is the Pats will go 9-7, maybe 10-6, and be out the first round of the playoffs. Moss will start whining when they lose a few games and he's not getting his receptions. Ok, I have one thing to say, the Chinese team is a big bunch of floppers! They get the slightest bump and they're on the ground delaying the game. Play for goodness sake would ya! Fox Sports: "He says he's in it to win a Super Bowl. But agreeing to this trade — I don't care if the Jets spent more than the Department of Defense this offseason, they're still coming off a 4-12 season — proves otherwise. Favre's desire to return to the championship round was less than his fear of not playing while he still thought he could. Maybe he was loathe to acknowledge that winters in Mississippi aren't what they're cracked up to be. By the same token, he should've known that winters in East Rutherford haven't been good for the Jets, either." 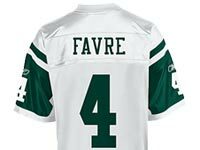 - Brett Favre is one of the best the game has ever seen, but I can't see him taking a 4-12 team to the Super Bowl. I'm thinking more like 8-8, 9-7 at the most. I think we will see some spectacular football and they'll possibly bump off the Pats at least once if Favre is on form. The big question is will we get the Favre of last year, or the one from the year before? I'm hoping for the former and an exciting year for the Jets. MSNBC: "BEIJING - A Chinese man stabbed the in-laws of the U.S. Olympic men's volleyball coach, killing one and injuring the other while they visited a Beijing tourist site near the main venue where Olympic competitions began Saturday, officials said." ESPN: "After spotting Georgia a five-run lead in the third inning, Fresno State struck for 15 runs over the next three innings for a 19-10 victory in Game 2 of the College World Series finals." - Unbelievable! Little Fresno State is one game away from a National Title. Get Fit Slowly: "This morning, I hit another magical 10 pound increment. Since November 1, I’ve managed to drop 30 pounds. That’s 31 weeks and 30 pounds for those of you counting. And even though I complain a lot, I really couldn’t be much happier. I’m fitter, lighter, and healthier than I was 8 months ago–a statement that I haven’t been able to say in a very long time. I’m hoping to keep that streak going for a very long time to come." - This is the hardest thing in the world to do! I want to lose fat, not weight, and I've had a heckuva time doing it. I drop ten, then gain it back. Maybe Get Fit Slowly can help. "When explaining why he did not want to go public, Jacobs said: 'The kinds of people I know about could put a bullet in the back of my head.'" ESPN: "Sonics chairman Clay Bennett is so eager to sever ties with Seattle that he's willing to leave the team's name, logo, colors and history behind to avoid a messy divorce." - If this turkey feels he must move the team the least he can do is leave the name behind for the next team in Seattle. As for the name of the team in Okie City, here's a list of Oklahoma State symbols(linked in the article above), you can also let your minds wander. What do you think of when you hear Oklahoma? UPDATE: I'd go with Oklahoma City Wild Turkeys. This would allow them to do a marketing deal with Wild Turkey Bourbon; logos on the uniforms, Wild Turkey on the sidelines instead of water or Gatorade, and discounted shots at the game. It could be a huge draw! ESPN: "Among major leaguers, though, just 8.2 percent were black players, down from 8.4 percent in 2006 and the lowest level in at least two decades." - So? Do we measure the number of white players in the NBA, or NFL? Statistics like this are nonsense. All it means is black folks are choosing to not play baseball, that's all. Does it really matter what color the player's skin is? Hey, I don't care if you're purple. I guess baseball needs something to distract from the steroid issue? Ok, I'm going to step out here and say the New England Patriots will lose at least one game. It's very difficult to go undefeated in the NFL. Something will happen along the way that will cause them to lose. My suggestion to the remaining teams. Get to Tom Brady and knock him to the ground, period. He can't take a hit and will take proximity sacks, dropping like a rag doll when he feels the presence of a rushing defender. Watching the Buffalo Bills rush two lineman, on occasion, last weekend made me ill. You can't let that guy stand back there all day with three big threats running down the field. I know, I know, I'm not a profession analyst but it seems to make sense. Oh, and another thing. If I were Pittsburgh I'd start prepping Hines Ward to play as a Free Safety and put him right over the top of Randy Moss. Hines Ward is a real throwback, smash mouth football all the way. He brings it each play so why not let him take a few shots at New England's wide receiver's? Mix up your defensive fronts, send four and five at a time, bring those backside safety blitzes and unchain James Harrison. That guy's a monster. SaveOurSonics.com: "Seattle - As expected, Sonics owner Clayton Bennett filed papers today with NBA commissioner David Stern to relocate the Sonics to Oklahoma City." - This is sad. Petition for an expansion team, don't move the Sonics. If they are moved they should be required to change their name. The SuperSonics name should stay in Seattle. Besides, it would be nice to choose a super colorful name for the move. I'll let you decide what it should be, please post a comment with your suggestions. ESPN: "Of course, the Bulls would like to see Bryant win the test of wills, because it would end with him in Chicago playing right alongside Deng. For now, though, Deng remains a dealbreaker. Not for the Bulls, but for Kobe." - Yes, Kobe, Shaq is the man. Don't let the door hit you on the backside on the way out. ESPN.com: "An Oklahoma City energy tycoon says the group that purchased the Seattle SuperSonics hopes to move the NBA franchise to Oklahoma City, but he acknowledges the team could make more money in the Pacific Northwest." - Ick. I can see a whole lot of trade requests coming. Would you rather live in Seattle or Oklahoma City? No offense OK city, but I think Seattle wins this contest. It's too bad a Seattle based owner couldn't be found. Then again, Oklahoma City, could be a wonderful place?? If they do move the team they should be forced to give up the name, ala Cleveland or Houston. I say go with a non-PC name, something like Oklahoma City Okies, or Rednecks, something completely against the grain. Yes, I'm serious, and not trying to offend anyone. Ever heard of the Fightin' Whities?